It’s about more than getting a major case of LSS. (SPOT.ph) It started out as a joke. When Broadway's Rock of Ages was adapted into a movie starring Tom Cruise as Stacee Jaxx in 2010, some PETA Theater members quipped, "Hey, why not Rak of Aegis?" Director Maribel Legarda heard the suggestion, a lightbulb popped above the heads of the production team, and they soon found themselves having coffee with the band members of Aegis to talk about a new original musical. Stringing together 20 songs of Aegis is a rock comedy-musical about Barangay Venizia, which has been submerged in floodwater for two months. One of its residents, Aileen, wants to rise out of poverty by becoming a YouTube singing sensation. Her father Kiel wants to find out the true cause of the flooding, while Aileen's suitor, Kenny, and his Barangay Captain mother Mary Jane, have become nouveau poor after the flood destroyed their shoe business. As PETA puts the final touches of the production in time for the January 31 opening, here are 10 reasons Rak of Aegis is worth watching. When PETA Theater asked Aegis' permission to work on Rak of Aegis, the band's answer was an immediate yes. They were more than excited to have their songs adapted into a Filipino musical. 1. It features the hits of Aegis. Whether you'd like to pretend you don't know them or are proud to declare that you enjoy belting out "Ayaw ko nang mangarap, ayaw ko nang magising!" at videoke bars, Aegis is more than just a '90s OPM band. When they came out with the chart-topping album Halik in 1998, their songs became the anthem of the sawi or broken-hearted. They followed up their success with other bestselling albums such as Mahal na Mahal Kita and Awit at Pag-Ibig. "There's no question na very iconic ang Aegis and they cut across all social classes. It's very Pinoy," said director Maribel Legarda. 2. It's an original Filipino musical. Despite expensive foreign productions arriving in Manila and Broadway hits being adapted by local theater groups, proudly Pinoy productions are just as competitive. 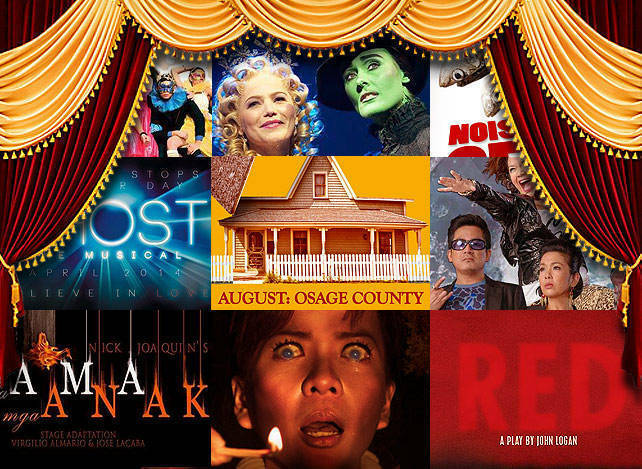 Rak of Aegis joins the likes of Sa Wakas (based on the songs by band Sugarfree) and Katy the Musical (chronicling the life of jazz chanteuse Katy dela Cruz) that have captured the hearts of contemporary Pinoy audiences. 3. Spotlight on Aegis' lesser-known tracks. It's not all about "Halik," "Luha," and "Basang-basa sa Ulan." As musical director Myke Salomon discovered, there are plenty more Aegis tracks that didn't make it to the hall of fame, but are just as addicting. "Nung pinakinggan ko na lahat [nung mga lesser-known songs], grabe ang ganda ng lyrics nila. ’Pag pinakinggan mo ng paulit-ulit yung mga kanta nila, may layer," said Salomon. "We discovered that not all their songs are sawi," added playwright Liza Magtoto. 4. It features the resilience of Pinoys. 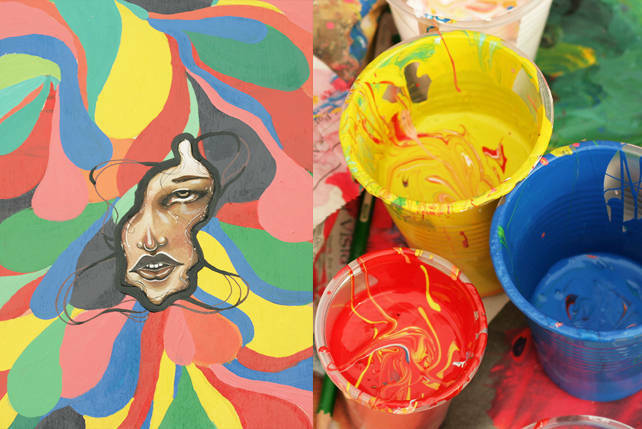 "The image of the flood kept inundating in my mind [while writing the play]," shared Magtoto. "How else to show resilience but in such a calamity?" She looked back at PETA's post-Ondoy relief efforts and saw her inspiration for the plot. "This is the backdrop of the characters that will sing these songs of Aegis... The spine of the play is this: (Losing and perhaps finding) love in the time of calamity." 5. Complex set design. 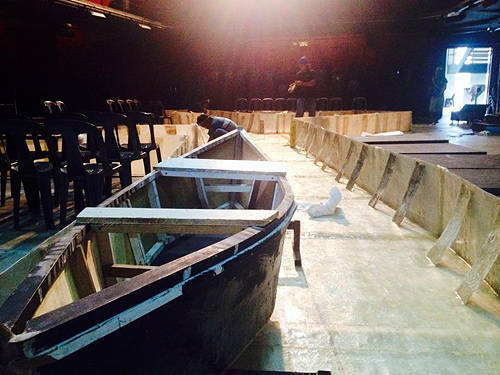 To bring to life the fictional Barangay Venizia, set designer Mio Infante created a multi-story semi arena stage that shows how a once thriving barangay has been ravaged by a typhoon and is submerged in the flood. 6. Water works. What good is a musical with lyrics such as "Heto ako, basang-basa sa ulan" without actual water on stage? Infante's set design includes a flooded mini-arena that the cast gets to dance and sing on. Is there any chance that the front row audiences will get slightly drenched a la Sea World? We'll see. 7. La Diva leads. One of the three members of Filipino pop girl group, La Diva, has landed the coveted role of Aileen. GMA singer Aicelle Santos is alternating with PETA thespian Joan Bugcat in the lead role, and both proved their mettle in belting out Aegis' songs at the audition last year. "Happy ako, walang pangamba, may pressure yet thankful always," Aicelle said about landing the lead role. 8. Isay Alvarez-Seña is stronger than ever. Despite being diagnosed with chronic lymphocytic leukemia, she kept her head up as she top billed Katy the Musical last year. She continues to pursue her passion by taking the role of Barangay Captain Mary Jane, who is at par with real-life husband Robert Seña's character Kiel in Rak of Aegis. The couple recently shared the good news that Alvarez-Seña is undergoing her final treatment next month. 9. It has the potential to grow into a bigger production or movie. The six-week run is actually an experimental production to see how audiences will react to the musical. If all goes well, PETA plans to produce a grander stage, bigger cast, and who knows, maybe even a film version. "If it works and people like it, why not?" said Legarda. They also plan to compose just-for-theater Aegis songs if the show becomes a hit. 10. They want to give back. That this is being staged after typhoon Yolanda (Haiyan) hit the Philippines is just a coincidence. "When this was being done, wala pa yung Yolanda," shared Legarda. "For me, nagkaroon tuloy siya ng extra meaning dahil sa nangyari [sa bagyo]." PETA is planning to produce a traveling production of Rak of Aegis, which will be staged for free in Tacloban and other areas ravaged by the recent typhoon. Rak of Aegis runs from January 31 to March 9, 2014 at The PETA Theater Center, No.5 Eymard Drive, New Manila, Quezon City. Tickets are available via Ticketworld and PETA Theater.